This Bad Boys SteelBook® edition has gone all in to satisfy fans of the movie. It has a debossed bullet hole on the front AND on police badge on the back. 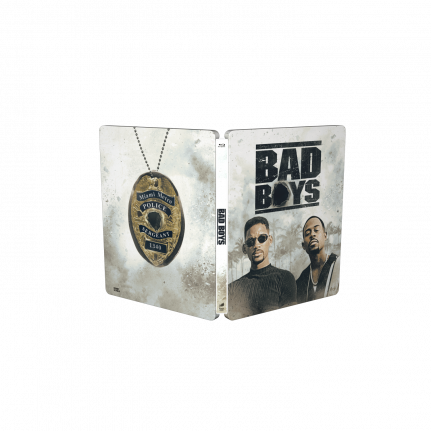 The spot gloss leaves a great shine on the title treatment, the characters and the police badge, making this a necessary piece in every SteelBook® collection. This bad boy features the extra material “Putting The Boom & Bang in The Bad Boys featurette”, Commentary with Director Michael Bay and 3 x Music Videos. Will Smith and Martin Lawrence team up as partners in crime, crime-fighting that is, in this action-packed flick about a couple of good guys who are real BAD BOYS! One hundred million dollars worth of confiscated heroin has just been jacked from police custody. Fast cars, a gorgeous woman and non-stop action make BAD BOYS a guaranteed good time!